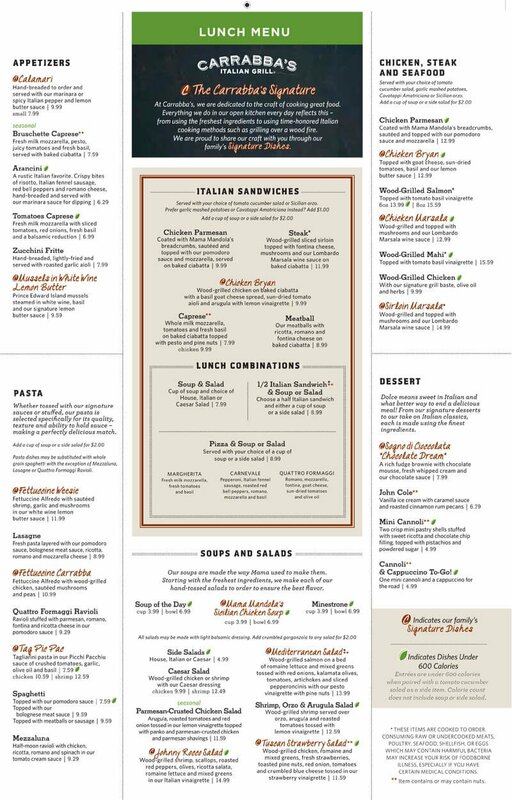 We have all you need to know about the full menu with prices at Carrabba’s Italian Grill®. Carrabba’s serves authentic Italian food in a casual eat in or take out atmosphere. Weekday specials like Amore Monday, Tasting Tuesday and Pizza & Wine Wednesday offer plenty of incentive for folks to dine at Carrabba’s during the week. Family Bundles offer busy moms and dads a great carry out option for those hectic work days…feeding a family of four authentic Italian cuisine has never been so easy! Below you will find the full menu with prices as well as some top picks with full descriptions. The menu at Carrabba’s is extensive. 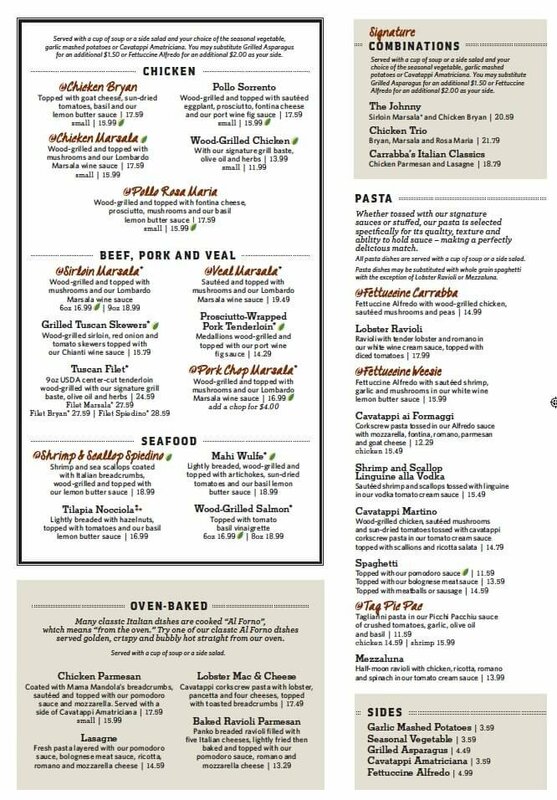 One great feature of the menu at Carrabba’s are the gluten free and under 600 calorie sections of the menu. Those that have special dietary restrictions or are watching their weight will appreciate the care given to help them find food on the menu that is well suited to their needs. There is even gluten free pasta available! If you are looking for a hearty meal, the extensive steak, seafood, pasta and wood-fired pizza sections of the menu are where you want to look first. If you just can’t make up your mind, consider the combinations section for mix and match ideas. Inspired by founder Damian Mandola’s mother Grace, this authentic Italian soup is a longtime customer favorite. A hint of spicy heat makes this chicken soup special. It may be your new favorite comfort food. If you are looking for a chicken dish, try this one. A chicken breast is grilled over a wood fire and topped with sautéed mushrooms, thinly sliced prosciutto and creamy fontina cheese. This dish is finished with a basil lemon butter sauce. It would pair very well with white wine. There is nothing like the delicate creamy taste of a well-made tomato vodka sauce. This version, balanced with tender sautéed shrimp and scallops will not disappoint you. It is one of the lighter pasta meals for those looking to save room for dessert. If you are going to Carrabba’s for the first time, you may want to try one of their wood fired pizzas. You can create your own combination from the many toppings, but this signature pizza is already perfectly balanced in flavor. Johnny Charles Carrabba, III and his uncle Damian Mandola opened what would later become the first Carrabba’s restaurant in 1986 in Houston, Texas. A second location was also opened in Houston that year. From the start, the dishes in the restaurant were inspired by recipes passed down in the family, most notably from Grace and Rose, Damian’s mother and sister respectively. The restaurant became a regional chain concentrated mostly in Florida by 1993 when Bloomin’ Brands (at that time named Outback Steakhouse, Inc.) invested in growing the business. By 2011 there were 232 locations of Carrabba’s Italian Grill across the country, although still largely concentrated in the Southeast. The family recipes that started the Carrabba’s legacy have still remained central to the restaurant’s menu. Many of them have been featured on a PBS program called Cucina Sicilia, hosted by Johnny and Damian. 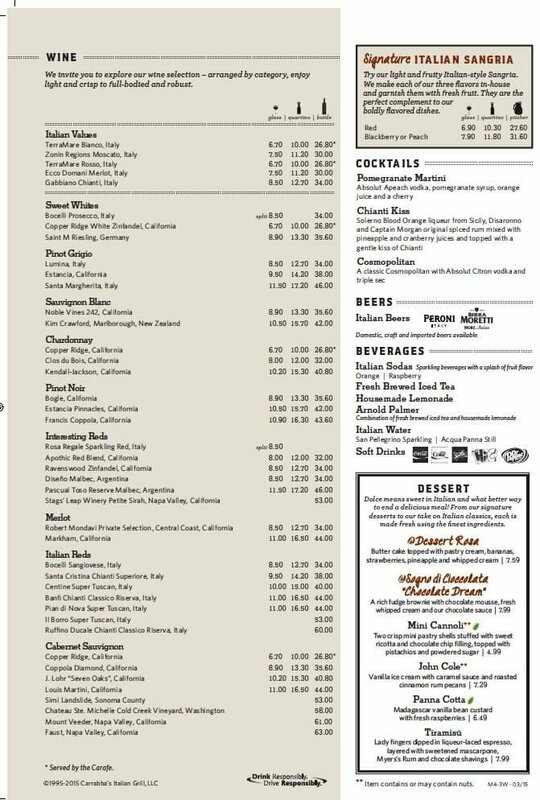 Carrabba's menu prices are subject to change without prior notice. Prices shown in images & the following table should be seen as estimates, and you should always check with your restaurant before ordering. 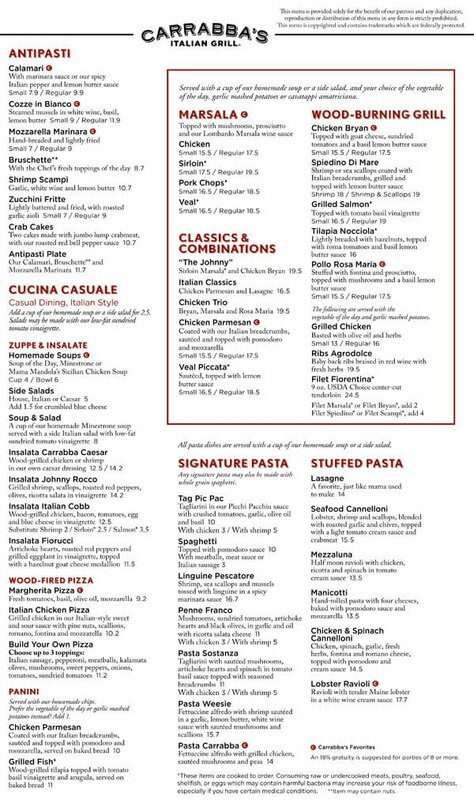 Carrabba's menu images sourced via e-mail from restaurant customer & menu-price.net user. menu-price.net does not guarantee the pricing or availability of any menu items listed in image or table format on this page. Pricing may vary from location to location.